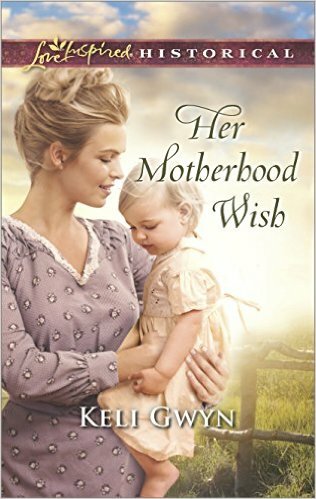 Her Motherhood Wish is another fun read by Keli Gwyn. On the way to work at the Double T Orphanage, Chip Evans and Caroline "Callie" Hunt, find two newly orphaned children, Ruby and Jasper. Not only did they find them, they became their caretakers! Chop does not want to get too close to Callie or the children because he doesn't want to mess up his future plans. On the other hand, Callie has fallen for the children......and Chip! How is that suppose to fit nto her own plans? Her Motherhood Wish is one of the reasons Keli Gwyn is among my favorite authors. I thought Chip could be infuriating to me and I felt like he needed some good sense knocked into him. I wanted to scream at him and say, "Look what you have right in front of you!" But then he shows his soft side and I see why sweet Callie was falling for him. I thought this book was great. There was a little mystery and suspense to make this sweet and clean story a perfect mix. I received this book from the author, but was not required to write a review. This review is of my opinion. Amy, I enjoyed your review. The mystery and suspense were fun elements in Her Motherhood Wish. Love Keli Gwyn's stories and the historical details she adds. Thanks for your review! I'm glad you enjoyed Chip and Callie's story, even though Chip can be quite frustrating at times. =) Thanks for posting this lovely review. I really appreciate it.